Adrian Smith (Bluebeard) with Meredeth Kelly (Judith). Credit is BU Photography. Bluebeard’s Castle kicked off the fifteenth annual Fringe Festival at Boston University on October 7, 2011 in the ninety-seat, round Lane-Comley Studio 210 Theatre. This hour-long opera runs for four performances (Saturday, October 8th at 6 and at 8 p.m. and Sunday, October 9th at 2 p.m.) with two casts in alternation. For this first performance I heard Heath Sorensen (bass) as Bluebeard and Celeste Fraser (soprano) as Judith. The other cast has Adrian Smith as Bluebeard and Meredeth Kelly as Judith. On the whole this evening’s entertainment was a qualified pleasure: the singing was good enough to make up for odd costuming and staging choices, as well as the “forcibly fringe” aspect of the performance. Sorensen has a rich, resonant voice, very much the basso profundo with his powerful depth and projection as well as his physical stature. Mr. Sorensen read the Bard’s opening Prologue as well, speaking with the same force and resonance. Celeste Fraser has a more florid voice with a wider, looser vibrato. More than Mr. Sorensen, Ms. Fraser delivered emotion to her vocal lines and lost herself in acting the part of Judith. This casting offered a studied contrast in voice and vocal style. While it did emphasize the marked difference between the two roles in this opera, I found it distracting from the power of the work as a whole and also distracting from the singing and characterizations of Sorensen and Fraser. William Lumpkin (Music Director, unacknowledged in the program as pianist for the performance) gave a stellar reading of the piano reduction and produced a wide range of tones and colors to bring Bartók’s music to life, though no piano can reproduce Bartók’s orchestration (here calling for a wide array of instruments including celesta, organ, and an off-stage choir of brass). Even as Lumpkin essayed valiantly and, at times, successfully, I regretted the absence of a full orchestra for this production. The opera has but one scene and the two singers remain on stage throughout, so a versatile set is key. An altar-like table stood in the center of the stage on which was a crumpled and tattered lace dress used as a prop during the Prologue. Behind it rose a vertical backdrop of twisted metal, signifying the castle (all that metal added some extra resonance on at least one occasion during the performance—seemingly an unexpected interaction of set and singer). Backstage center, a circular medallion sporting blue glass in its metal frame surmounted the sole entrance. Beneath and behind this “moon,” I could see a baby grand piano. This set delineated the castle; the seven doors were imaginary—part of the fourth wall, so the audience facing the stage (but not those seated on the sides) could see the singers’ facial reactions as each door was opened. The costuming for this production was curious. Bluebeard sported a mauve suede ankle-length duster with black brocade cuffs and collar, worthy of some gothic dandy. Paired with black jeans and motorcycle boots, as well as a finger-length silver skull and bones ring, the outfit took on a more sinister air. The addition of hardware store chain, tacked to the duster (including one strand running the length of the back), led to excess jangling and clanging during the opera. That proved a sonic distraction and should be re-thought. It conjures up images of a ghost more than a magical nobleman. Judith wore a disheveled white dress—fitting since she was a new bride—but the peacock brooch pinned to her belt, with seed-pearls where the eyes of the feathers would have been, was an odd addition. I kept looking for deeper symbolism in this peacock every time I noticed it. I fear I may have already put more thought into its presence than the costume designer did. I read that Boston University’s College of Fine Arts has inaugurated a Keyword Initiative, and this year that keyword is “violence.” I began inescapably to see the twisted metal of the scenery in light of recent, historic violence—a comparison best avoided since it does not fit with this opera at all. In addition to the psychological violence depicted in Balázs’s libretto and Bartók’s music, the singers enacted domestic violence. The railroad spike (rather than a key) used to open the seven doors also stood in for a knife in one scene, held against Judith’s neck. This violence felt gratuitous and awkward (I was not alone in feeling thus; the woman beside me gasped). The Director’s Note in the program was three quotes from serial killers. The citations are interesting, but I learned more about Jim Petosa’s ideas and vision for this production afterwards when I called up an article about the Festival. More revelatory is the history of Béla Balázs attending the 1910 Waldbauer-Kerpely Quartet concerts of music by Bartók and Kodály with a pair of brass knuckles; his sister and his wife had to restrain him from attacking those who jeered the music. Such confrontational violence, reacting against societal norms and new art, mirrors the violence in Balázs’s play: the confrontation between Bluebeard and Judith, conflicting expectations of their marriage, and the shock of what is new leading to physical violence. 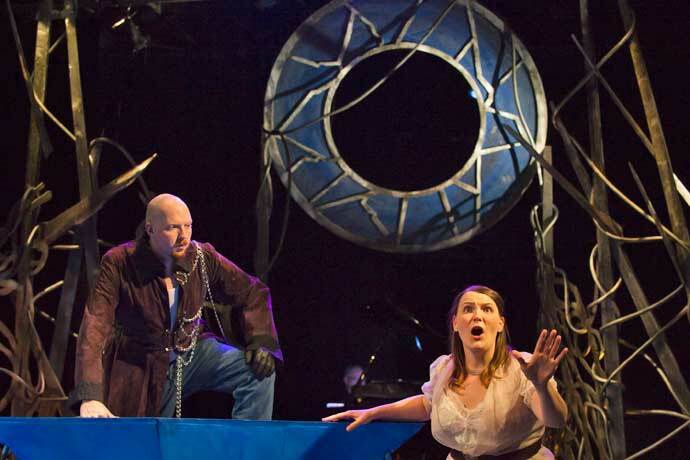 Bluebeard’s Castle is a marginal work because of the difficulty of the music and the symbolist libretto, as well as a fringe programming choice because of the requirements for extensive orchestra and only two singers. This production seems to construe “fringe” as “edgy”—hence the costuming choices, the staging of violent interactions, and the quotes by serial killers in the program. I would rather that the Fringe Festival present well-realized and high quality performances of atypical works, drawing on the full and rich resources of Boston University’s Schools of Music and Theatre. It seems unfair to the singers to ask them to learn such challenging roles and then deny them a full orchestra for their performances. It also feels disrespectful to omit the performers’ bios from the program. In sum, the genuine enjoyment I derived from this evening owes everything to the music-making of Mr. Sorensen, Ms. Fraser, and Mr. Lumpkin. They managed to overcome the formidable obstacles posed by the rest of this production. Hmm… I was under the impression that Bartok’s opera was more widely loved. Works like Pfitzner’s ‘Palestrina’, Schoenberg’s ‘Moses and Aron’, Hindemith’s ‘Mathis der Maler’, Dukas ‘Ariadne and Bluebeard’ Schreker’s ‘Der Ferne Klang’, Delius’ ‘A Village Romeo and Juliet’ or Enesco’s ‘Oedipe’ are better described as ‘marginal fringe’ I think. There’s something weird about B.U.’s concert publicity and programming. No one at any of the three music offices at B.U. that I telephoned yesterday could tell me in what language the Bartok would be sung, nor could the Box Office today (in person), nor does the present review. Neither were the advertisements for the opera clear about featuring a piano reduction of the orchestral score. All I found in the ads I saw was “B.U. University Theatre, 264 Huntington Ave.” How would one guess that the Bartok would be performed in a smaller venue in that building and that there’d be no orchestra? Yesterday I attended the concert of the Arneis Quartet at B.U.’s Concert Hall on upper Commonwealth Avenue. I’d seen an ad for it on the back of an earlier B.U. concert-program at Tsai Performance Center, though it didn’t say what the Arneis program would be. Three calls to three different B.U. music offices yesterday brought the following responses: “I don’t see any quartet recital on our schedule tonight,” “Yes, the Arneis is playing this evening but no, we have no record of what the program will be,” and “The only music at a B.U. venue tonight is a performance of ‘Bluebeard. '” As it turned out, the second half of the excellent Arneis concert featured Schubert’s Cello Quintet, but the printed program didn’t even list the second cellist, and the announcement of his name from the stage was so perfunctory and low-keyed that surely no one beyond the second row could make out the name. I think the B.U. College of Music should get its act together and share what it knows with the other offices associated with classical music events at the B.U. Theatre, the Concert Hall, and the Tsai Performance Center. When two offices don’t even know a concert is taking place, and no one has information on the program, frustrated prospective audiences might well thin out. Sorry about the misleading title. Please permit my restatement. I’d like to second Alan Levinson’s comment. I was astonished that BU could present Bluebeard’s Castle twice on one day. Publicity didn’t name the singers, nor indicate alternate casts, nor specify the use of a piano reduction. This is simple stuff. Had I known Meredith Kelly was performing I would have arranged my weekend around catching her performance.